I'm Avital. 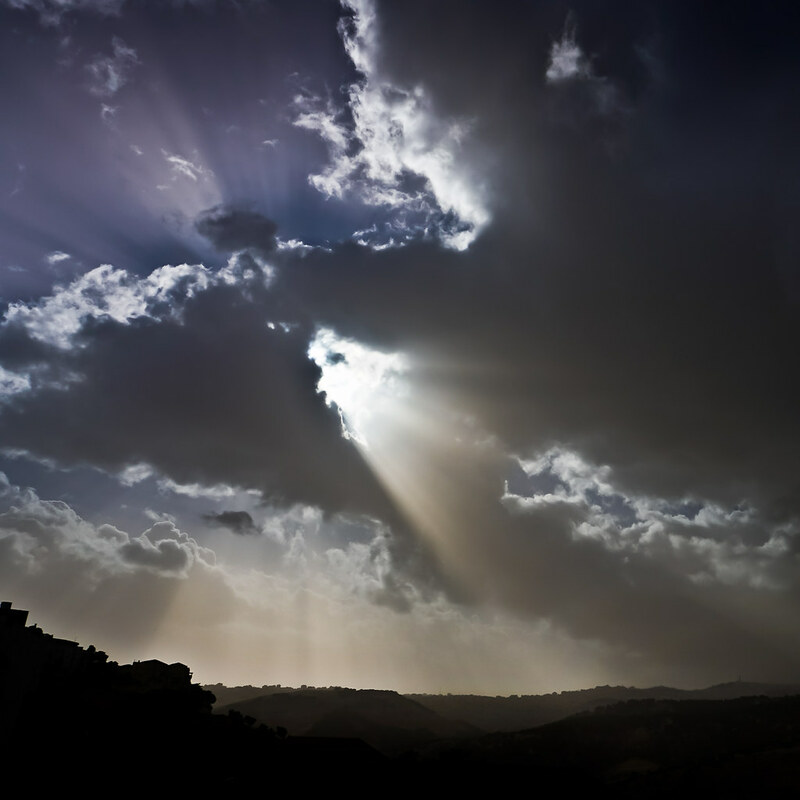 I write about photography, crafts, food, and life in Israel. Actually, the new electric train line connecting Jerusalem with the rest of the country is not high speed and does not, in fact, reach Tel Aviv! It is currently in its trial period and is free for the next 3 months if you order vouchers in advance. Because my husband is a transport fan and I will photograph almost anything, we reserved places on the 2nd train to leave Jerusalem, at 7:00 a.m. (We would have loved to be on the first train, but it wasn’t practical without a car and living in Maale Adumim.) 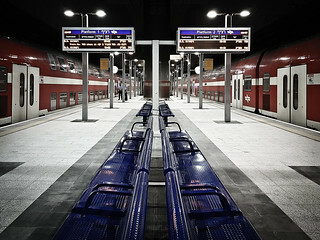 The train does not run at its full speed (160 km/h) and does not reach Tel Aviv. 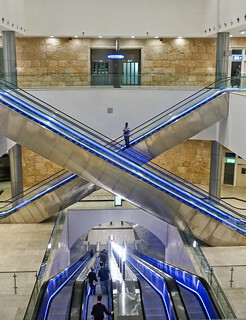 It does, however, reach Ben Gurion airport, where you can switch to a regular diesel train for the rest of the journey. 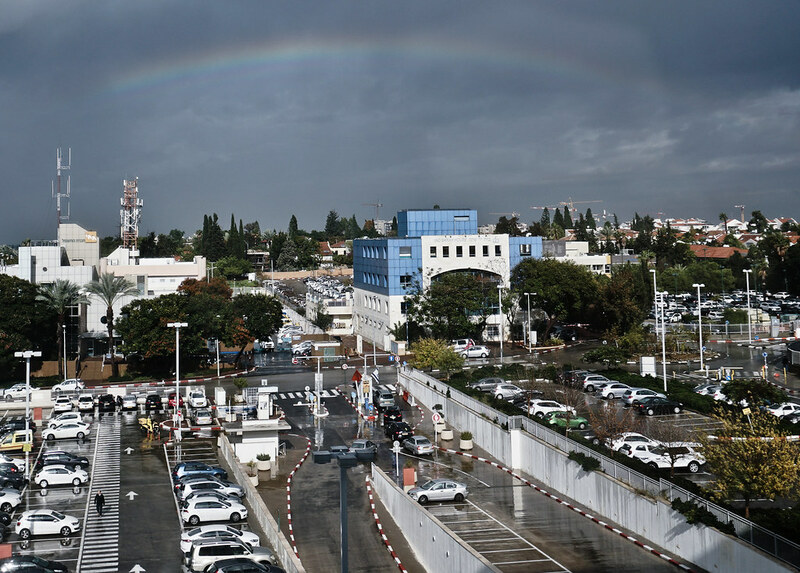 We were only interested in the electric train, however, so we had a cup of coffee at the airport and headed back to Jerusalem. This man was the only other person in our section of the train. 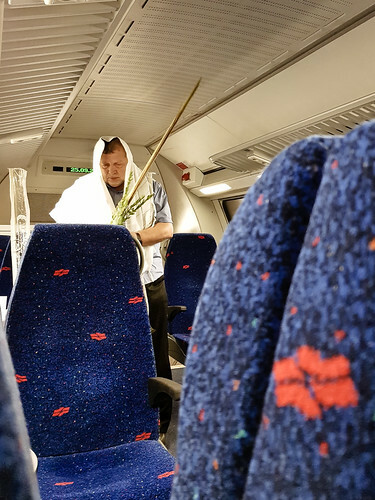 Since he would have had to be at the station early, he came prepared, with his etrog, lulav, and tallit (citron, palm branch, prayer shawl). 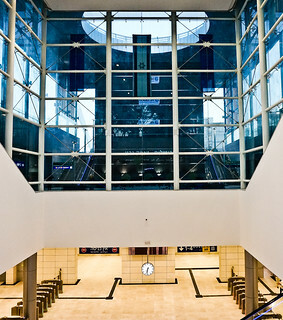 I’d never seen the Yitzhak Navon train station before, so I went a little nuts with the camera. 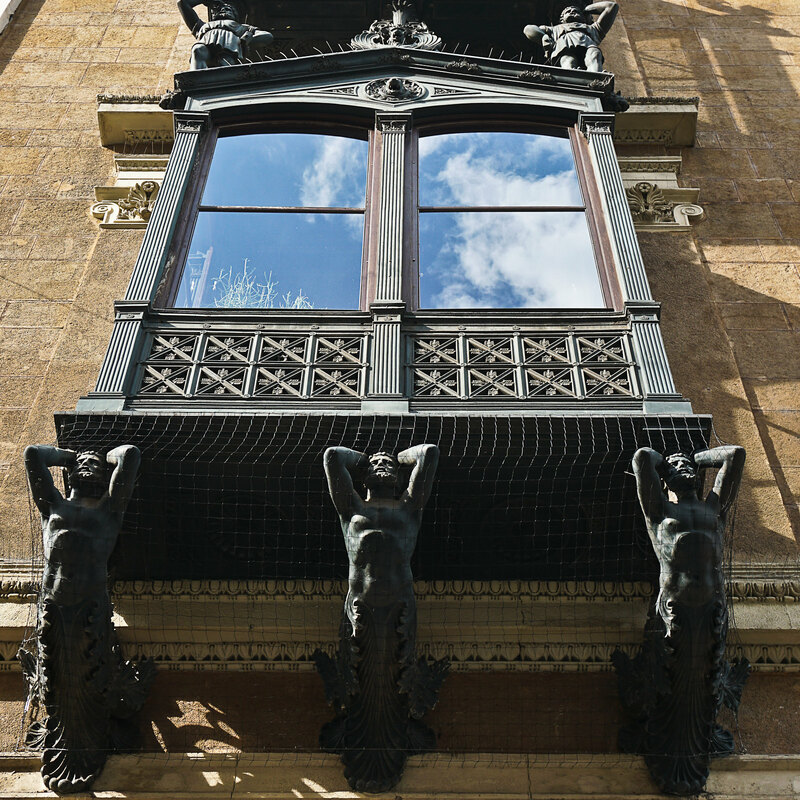 We don’t have a lot of modern architecture in Jerusalem. 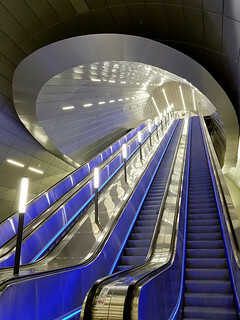 The train platform is 80 meters underground, which makes it the 5th deepest underground station in the world. 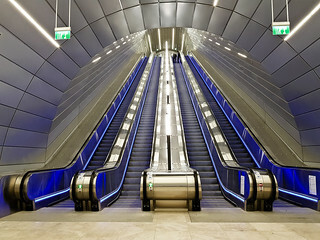 There are 6 fairly long escalators (elevators for those with luggage or prams), so you do need to allow about 10 minutes to reach the platform from the street level. 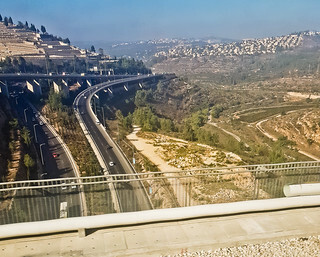 The reason the station is so deep is because electric trains cannot climb steep slopes, and Jerusalem is considerably higher than Tel Aviv. So the first part of the journey is mainly through tunnels and a very high bridge around the town of Motza. The trains themselves are not new. They’re the 2-level trains used on regular routes, converted from diesel to electricity. 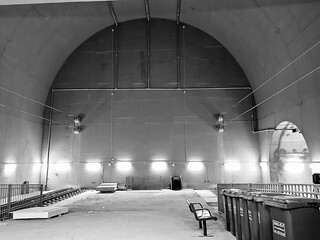 This is the “protected area”, probably the deepest bomb shelter in the country. Right now, only 2 platforms are in operation. 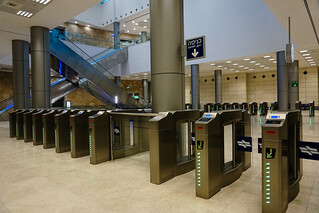 The station has 4 platforms. The view from the Motza bridge is not nearly as scary as it looks from below, because you don’t really get a sense of the height. 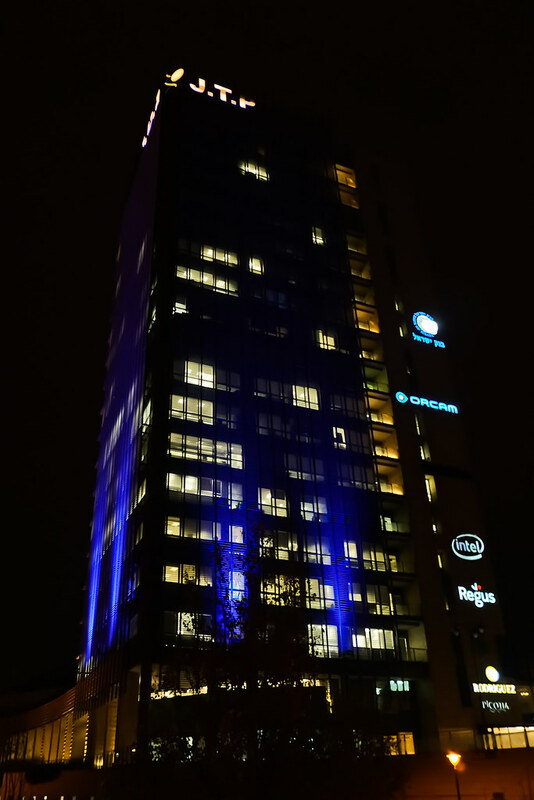 The windows weren’t very clear and I was using my cellphone, so this image is not very clear. Literally, the end of the line. 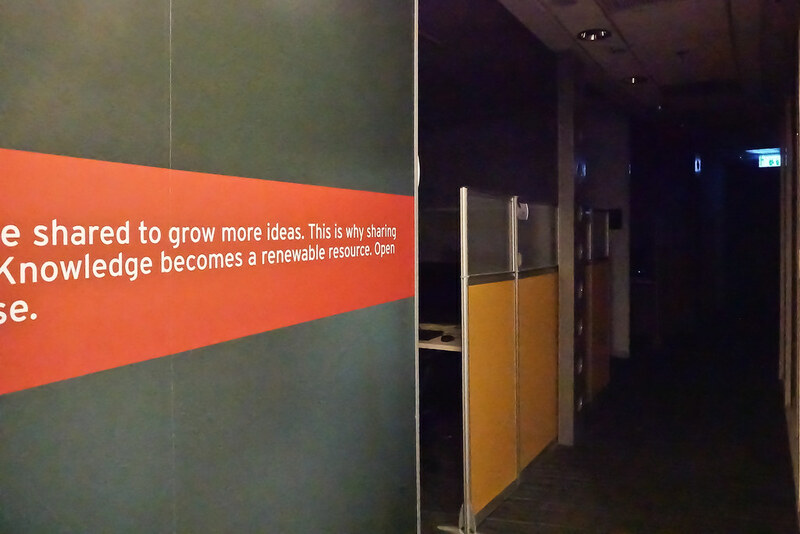 I assume that this area is normally inaccessible to the public, but the door was open, so I took a few shots. 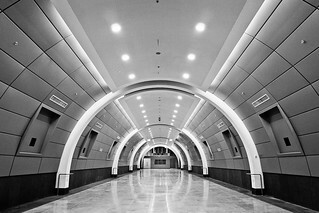 The tunnel on the right is an emergency exit. I think it emerges in the hillside overlooking the abandoned village of Liftah. 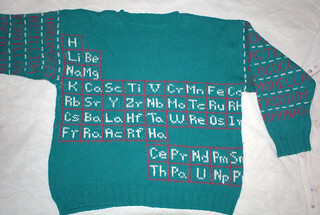 After nearly 20 years, I decided it was time to update the Periodic Table sweater. So here it is, with elements 111-118 included. It required 10 balls of blue Cascade 220 Superwash wool (8 blue, 1 purple, 1 cream). It took me about 3 weeks. 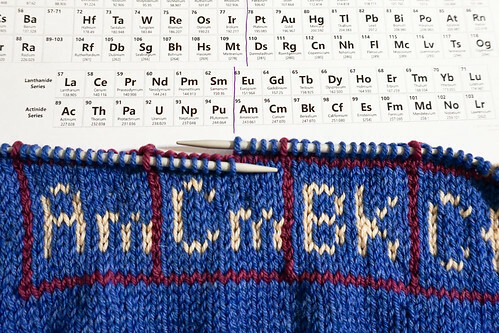 I knitted the letters without charting, so some are not identical. 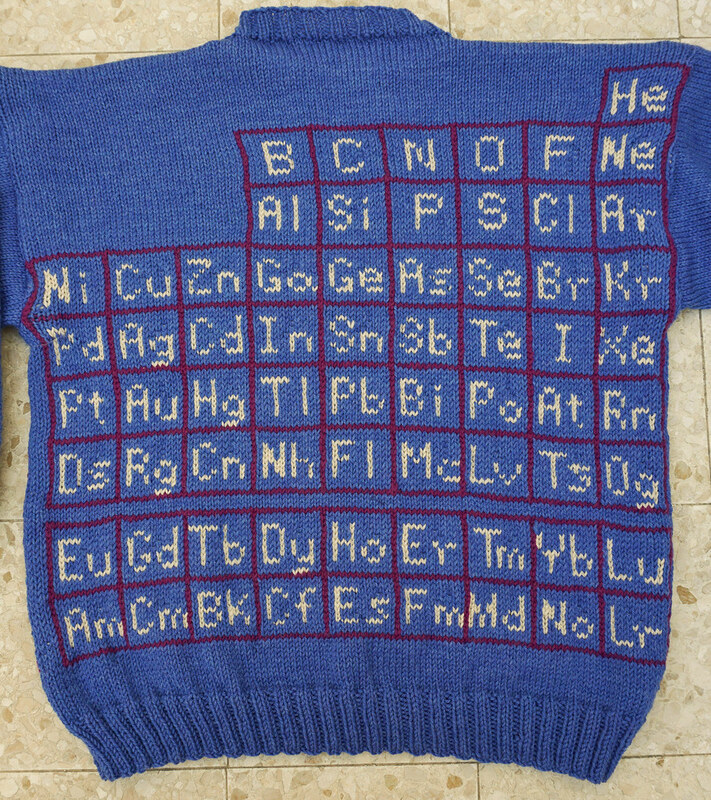 The lines are intarsia and the letters are stranded. The body was knit in the round and the sleeves were steeked. Finishing the ends on the inside was a nightmare because the cream yarn was not carried all the way around in the first two rows. 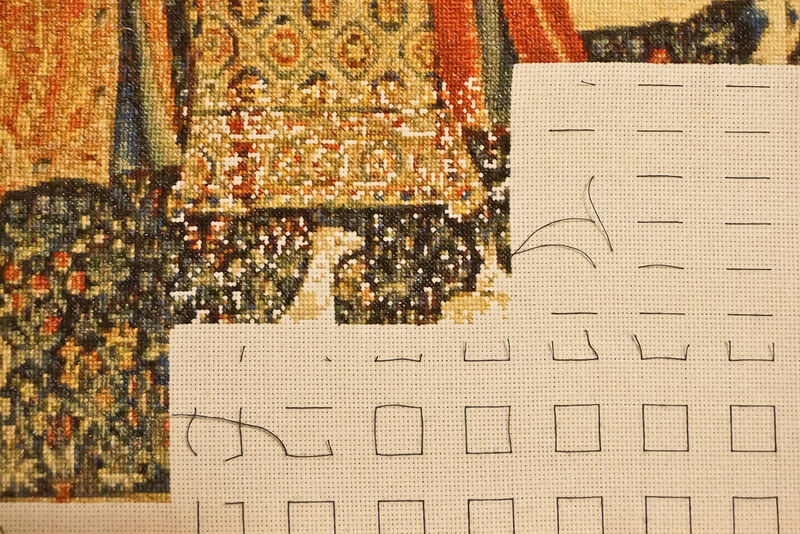 I see an error in the grid, which I will fix right away. 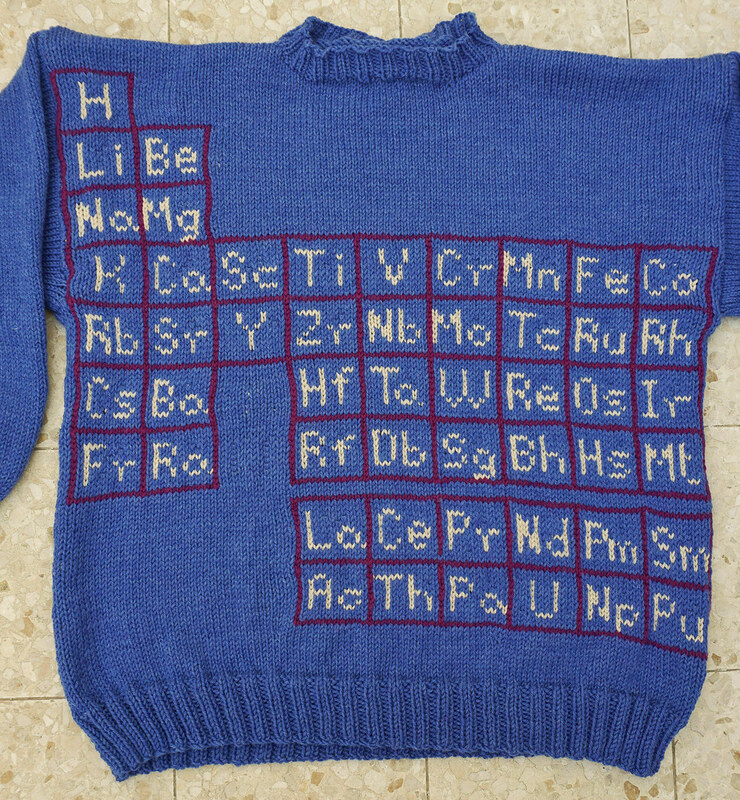 The original Periodic Table sweater was meant as a joke. First, the colours are really ugly because the yarn was a gift (Woolease, which wasn’t available in Israel at the time). One sleeve has names of bacteria and the other has names of fungi. Since no one ever showed much interest in the sleeves, I didn’t bother repeating the feat. 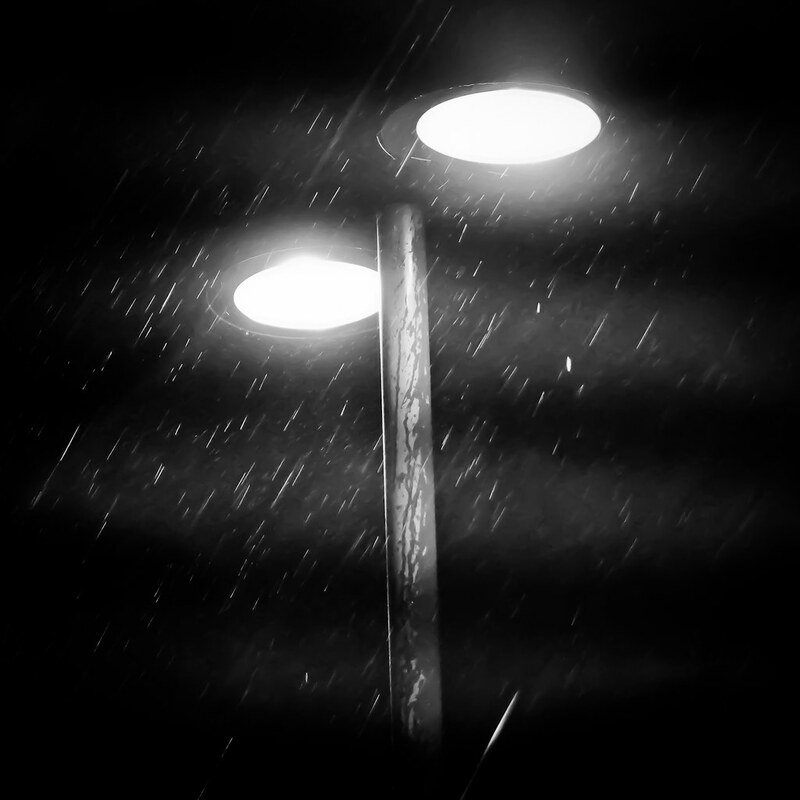 Streetlamp during a heavy rainstorm. I had to force myself to go out to take this photo. 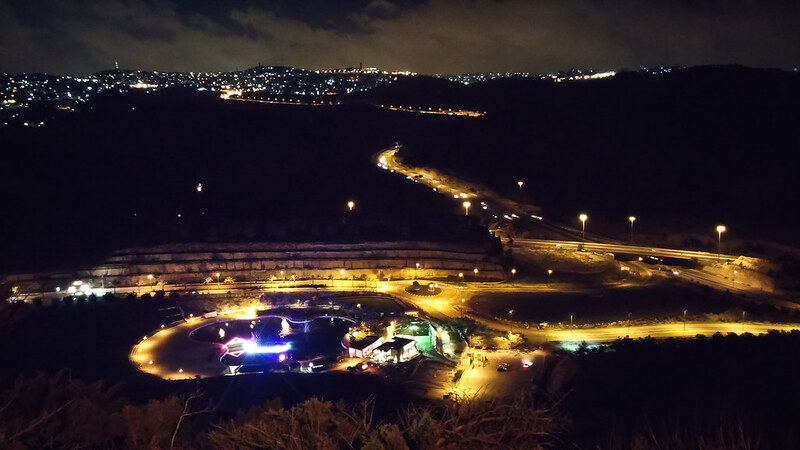 Entrance to Maale Adumim in foreground, Jerusalem in background, taken with LG G3 phonecam while on one of my rather infrequent runs. 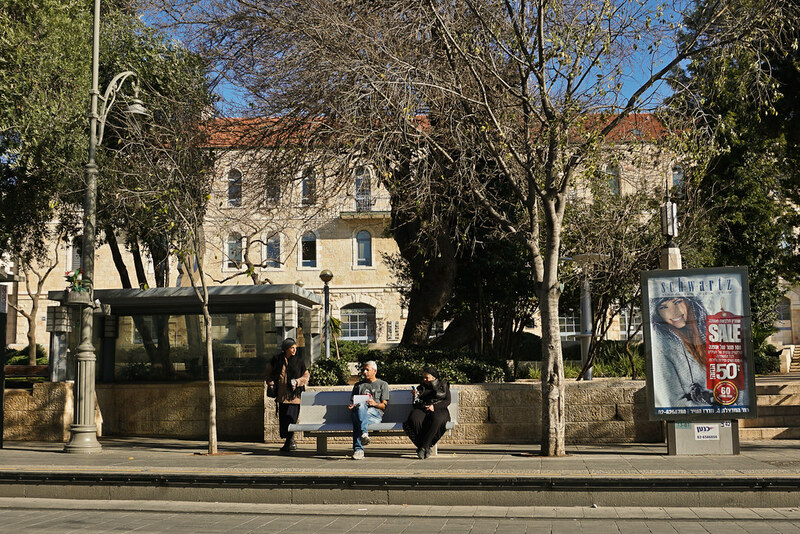 City hall tram stop, Jerusalem. 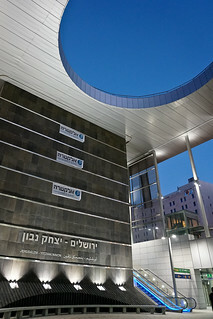 Jerusalem Technology Park office tower, Har Hotzvim, Jerusalem. 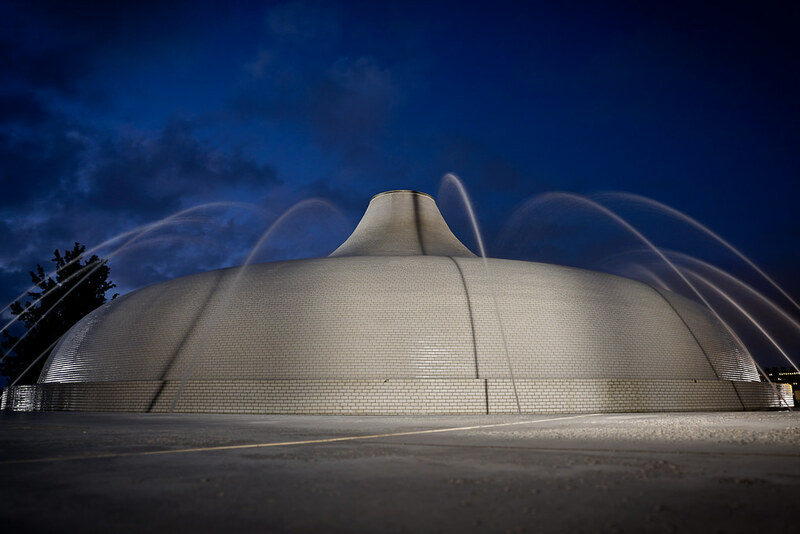 Shrine of the Book, Israel Museum, Jerusalem. I used a long exposure to smooth the water. I didn’t have a tripod, so I set the camera on a ledge and used the timer. 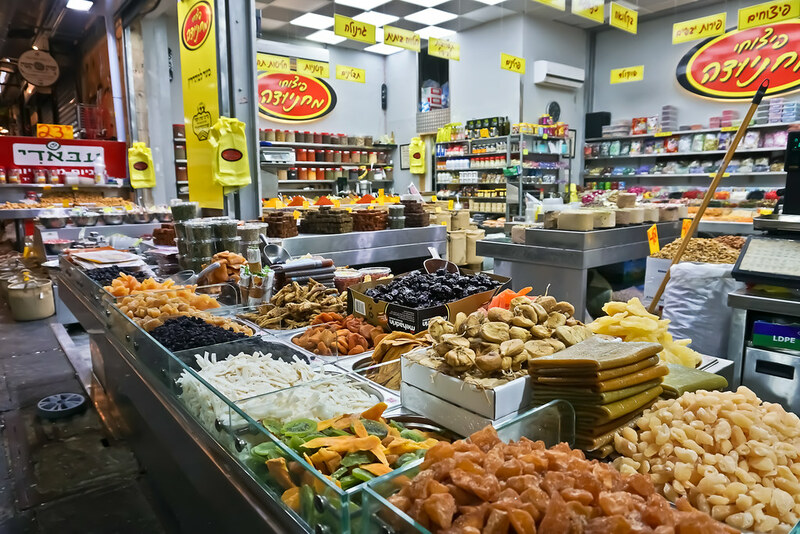 Spice stall, Mahaneh Yehuda shuk, Jerusalem, after meeting a friend for dinner. This is only half the shop, by the way. I didn’t have a wide enough lens to include the other side. 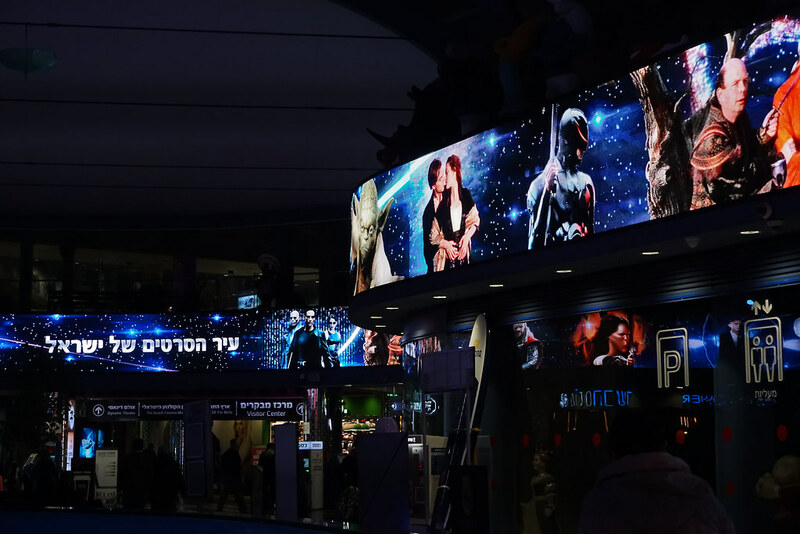 Cinema City, Jerusalem, while waiting for my son, so that we could see Star Wars VIII. Work at 6 a.m. I live 100 km from the office, so I carpool with a coworker/neighbour a couple times a week. We leave at 5 a.m., arrive at 6. I’m usually the first to turn on the lights and deactivate the alarm. 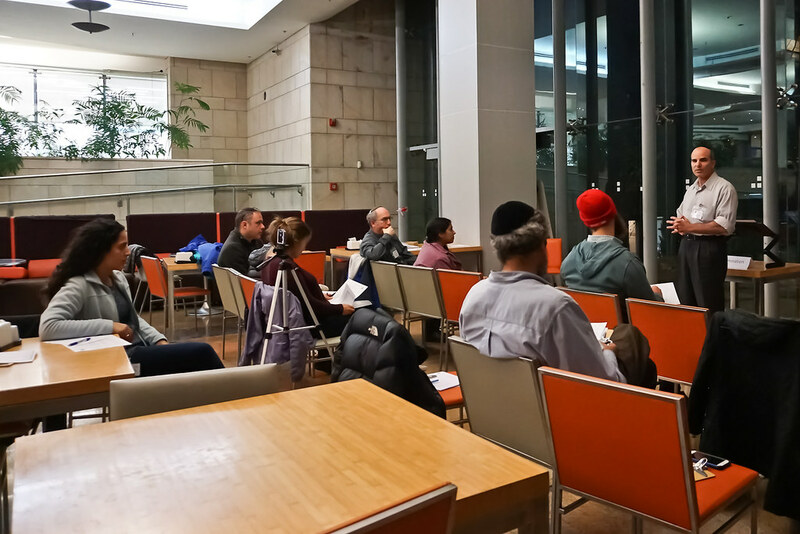 Jerusalem Toastmasters, in Har Hotzvim. I’ve been a member since 2015 and I’m currently its president, which means I don’t have too much to do if everyone else does their job. If you’re in the area, come by for a visit! 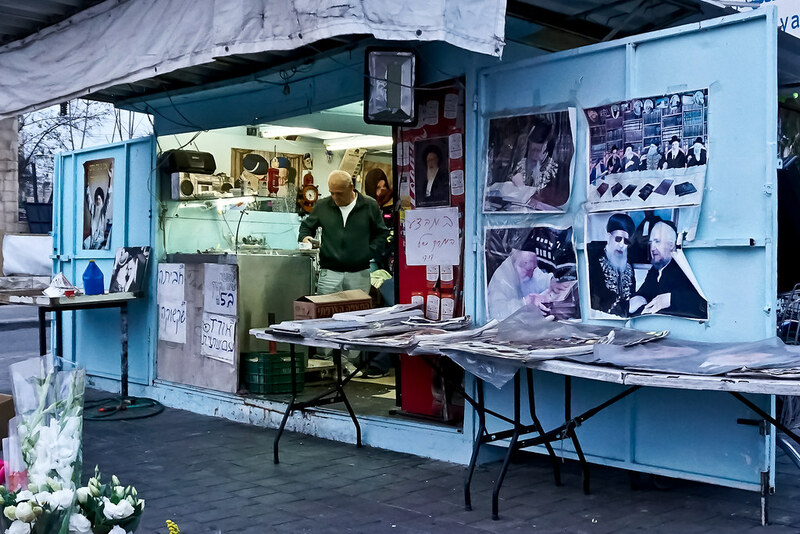 Kiosk in Sanhedriya, Jerusalem, on the way to Toastmasters. They seem to sell everything — hot food, newspapers, umbrellas, flowers. The decor is dominated by Sephardi rabbis. Last weekend we had heavy rain and strong winds. Naturally, I was preparing comfort foods in the kitchen for Shabbat. “Smashed potatoes” are so easy and so delicious. Boil a pot of potatoes until tender. 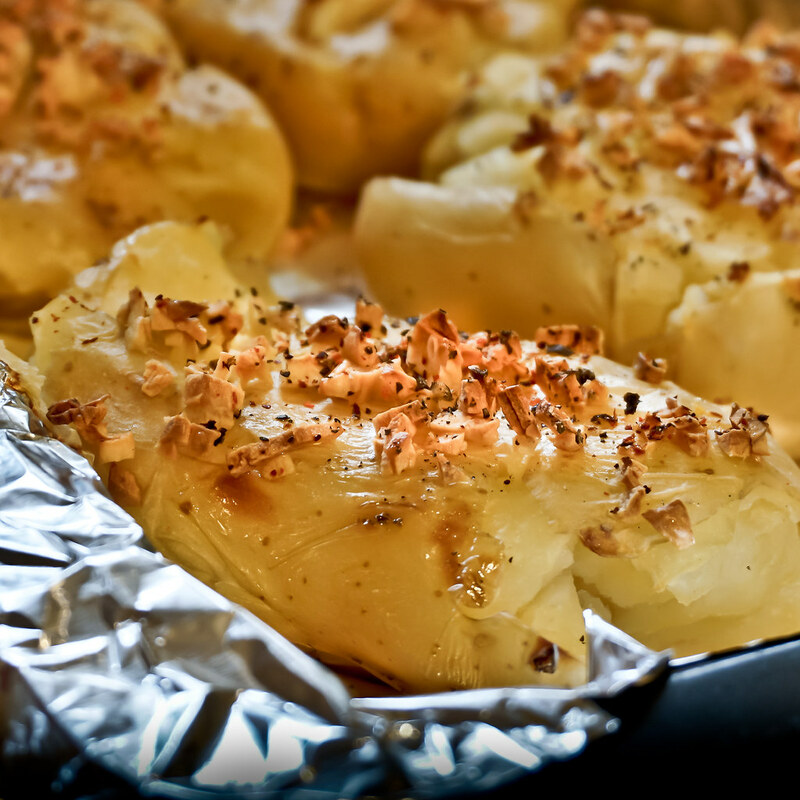 Drain and place on a foil-covered baking sheet. Smash gently with a potato masher. Sprinkle with chopped garlic, salt, freshly ground pepper, paprika, or whatever takes your fancy (cheese, fried onion). Drizzle with olive oil and bake in a medium oven until the tops are golden and the edges start to look crispy. I’ve very quietly started a Project 365, with the specific goal of mastering my new Sony Alpha 6300 mirrorless camera. 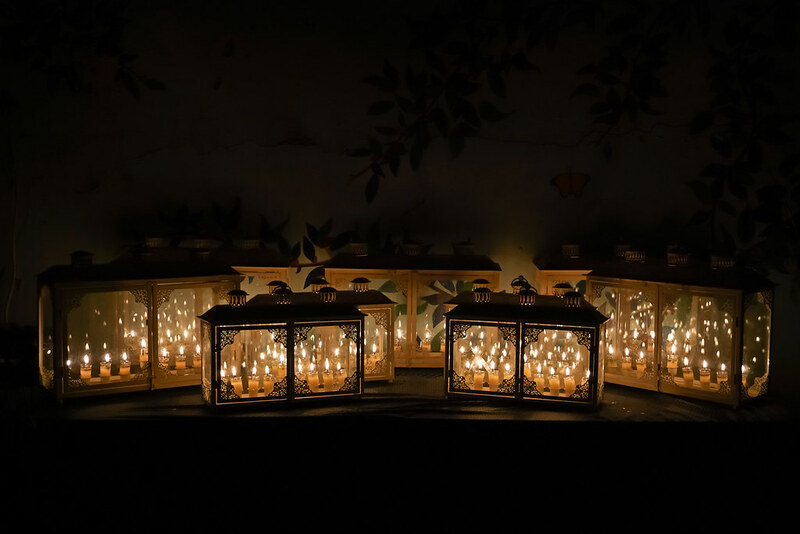 When I took it out during Hanukkah, I was really frustrated over the fact that I didn’t know the settings well enough to be able to set it in the dark and that I wasn’t positive I was locking the focus in low light. At least the Sony is much lighter to haul around than the Canon T2i with 18-135mm lens. 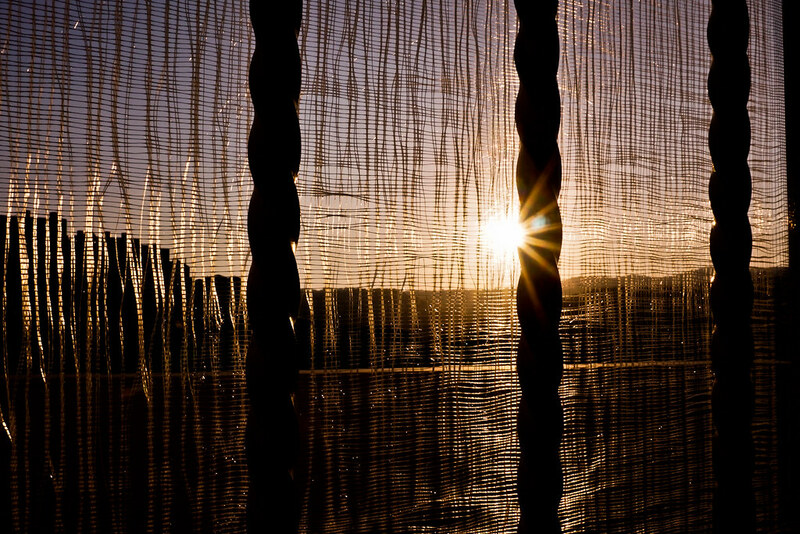 Photo above is the funky weave of our screen door leading to the back balcony. Sometimes there are things to shoot. 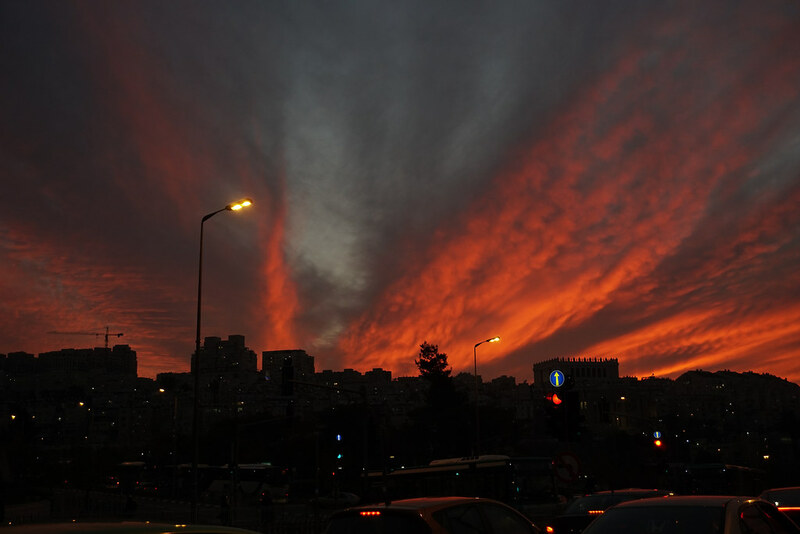 This sunset was past its peak, but I was on a bus and had to wait until I got off the bus to photograph the sky. By the way, this was not post-processed. Dust storm moving in, before the rain storm. Other times, there isn’t a lot to shoot. I find that after Shabbat goes out is a tough time. After doing dishes, tidying up, I’m usually too tired to think of a photo and don’t want to walk into town on the chance that there might be something interesting at the mall, so I usually shoot something inside my house, like my embroidery. Tip if you’re doing a project 365: make a list of easy shots for those times when you don’t feel like taking photos. Rainbow seen from my office window, which is why there are reflections off the glass, the white balance is a little too cool, etc. 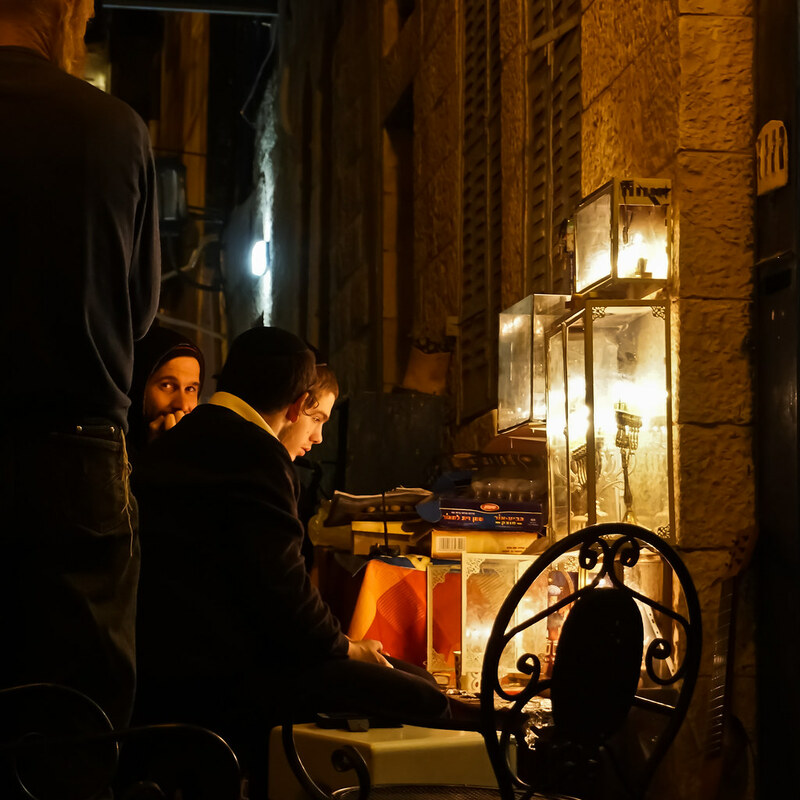 I wandered for a couple hours through the Nachlaot neighbourhood of Jerusalem on the eighth night of Hanukkah (Dec. 19, 2017). 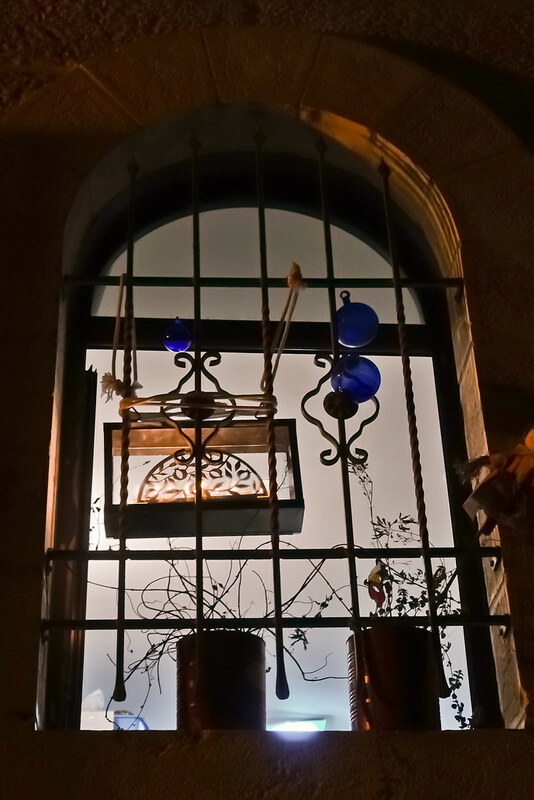 Nachlaot is a warren of alleys and courtyards, gentrified houses beside crumbling apartment buildings. 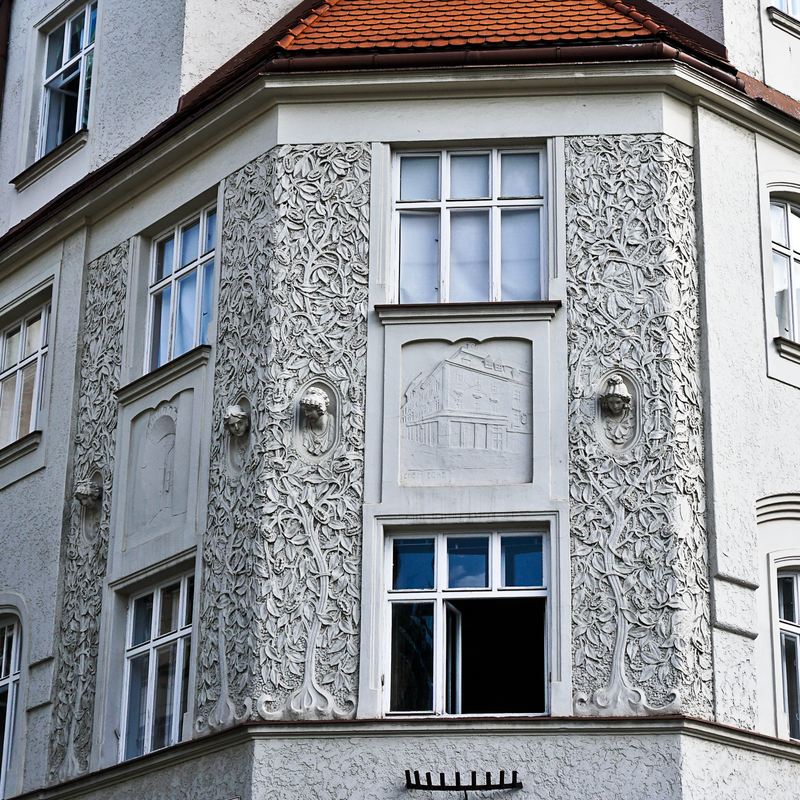 Most of the buildings date from the 19th century. It was surprisingly crowded that night. There were two Hebrew-speaking tour groups and a lot of hanukkah parties. 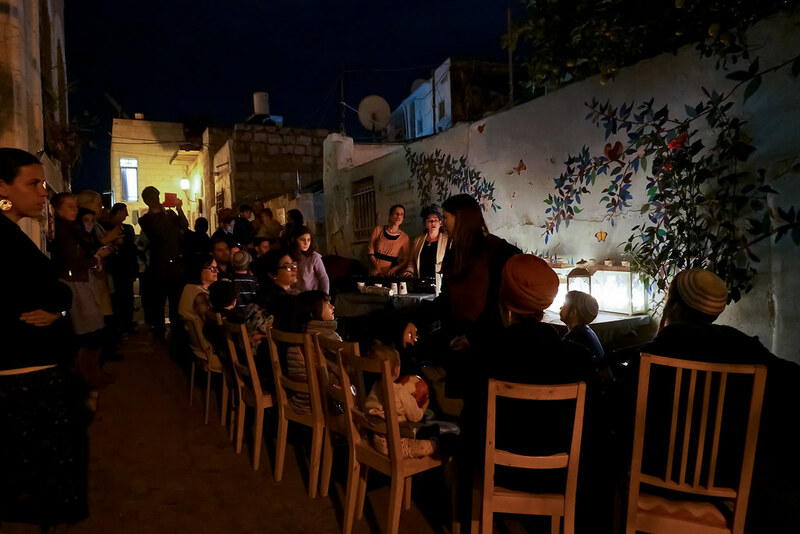 In one of the alleys, a family set up a large table with nine glass boxes and oil-burning hanukkah lamps. They brought out an electric keyboard, a guitar, and a row of chairs. Then each family member lit in order of age. 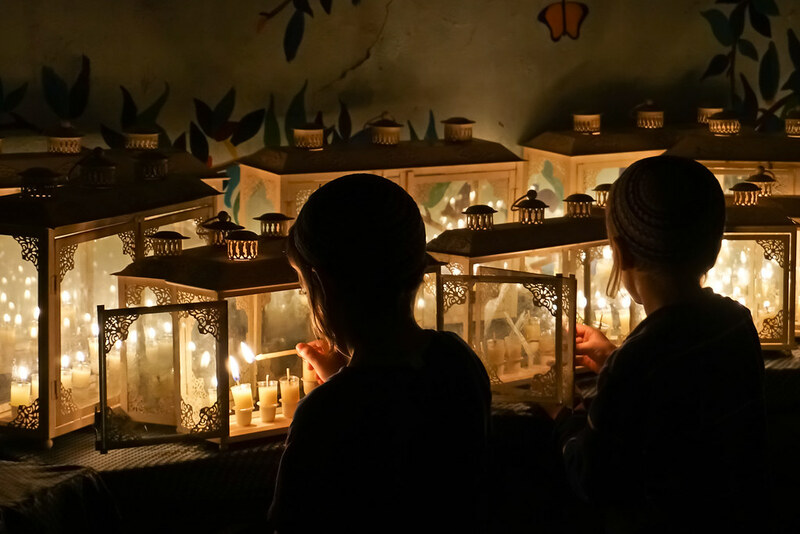 I photographed the youngest boys lighting their lamps (above). I was about 2 meters away and took this with a 16-50mm lens on a Sony Alpha 6300 mirrorless camera. While the lens doesn’t have a long reach, it is fairly small. The fact that the camera is silent is a big advantage when doing any kind of street photography where the noise of a shutter would be intrusive. Right across the alley from the hanukkah party was this small hanukkiah tied to the bars of a window. 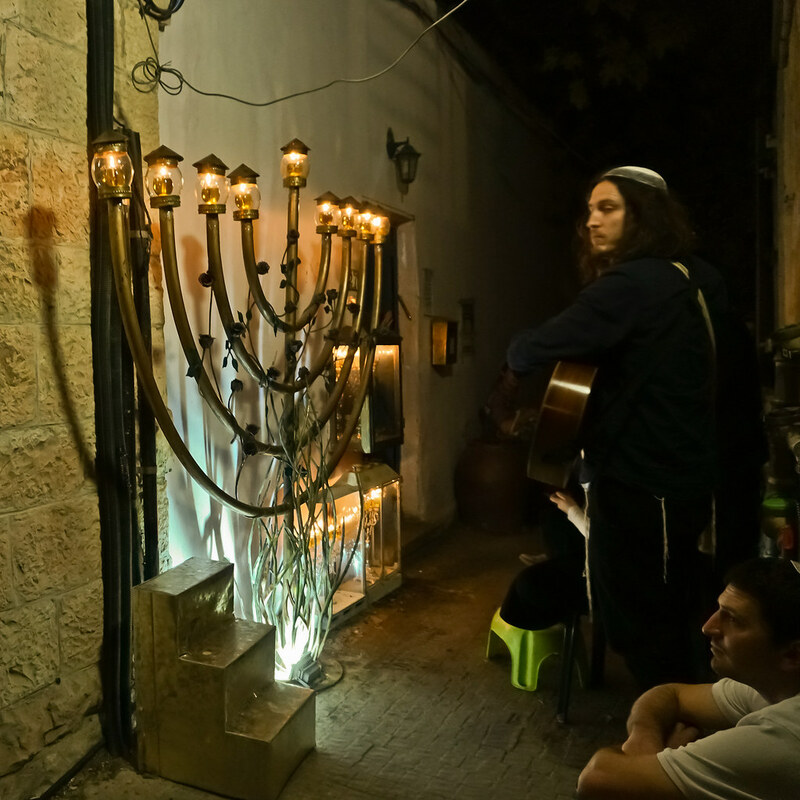 Another hanukkah party, with guitarist and harmonica player, was winding down by the time I got close enough to photograph the large hanukkiah. When it was in full swing the alley was filled with people singing and it was impossible for me to see over people’s heads. A much smaller party, in an alley that was only about 2 meters wide. This was one of the more bizarre hanukkiot I saw. 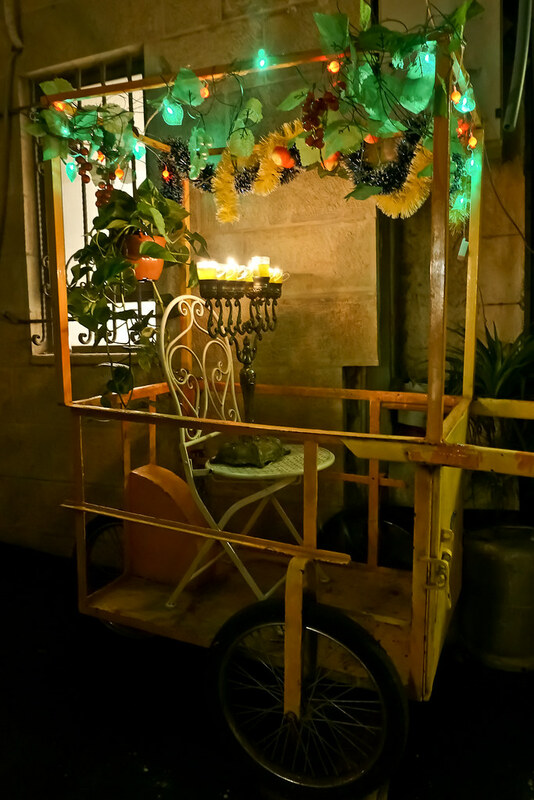 A wheeled cart decorated with plastic fruit, streamers, and flashing green and red lights was parked in an alley outside a house. I strongly suspect that the cart is actually used to bring a groom to the chuppah. I’ve seen similar contraptions at kibbutz weddings, pulled by the groom’s friends, instead of the traditional tractor. 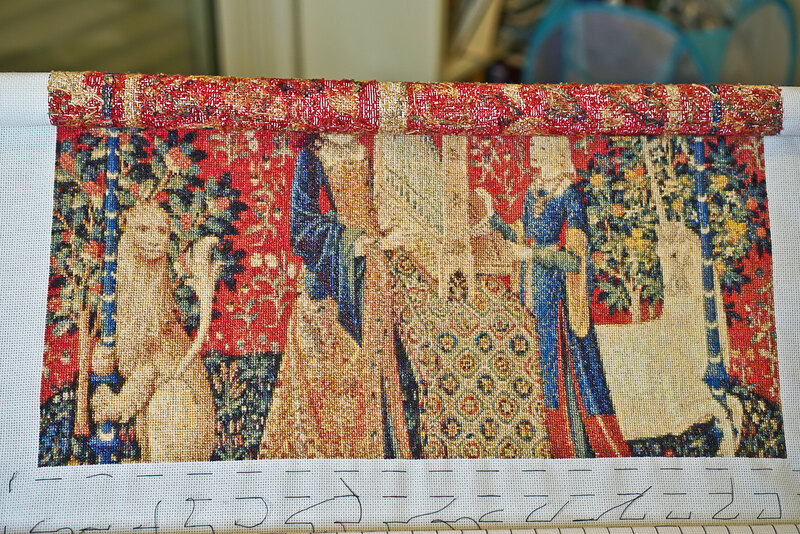 Just wanted to brag about finishing another row in the endless embroidery. Did I mention that it contains over 180,000 stitches? If you’re working on this piece, don’t give up! The tablecloth is a killer and takes about twice as long as the other pages, but the lion and unicorn bodies are easier than the fruit salad that surrounds them. Note to self: if you’re running a long race, it’s a good idea to train. I traveled a lot this summer, so my running fell by the wayside. Besides, I figured, the Arad to Masada half-marathon is mostly downhill, right? Er, almost. The beginning and end are downhill but in the middle, there are some tough hills. Also, 21 kilometers is a significant distance, not to be taken lightly unless you can run 15 kilometers without much effort. I was barely running 7 kilometers when I realised that the race date was only a week away. I got through it without hurting myself, only through experience and good form. The fact that they’d re-surfaced the old Arad road to the Roman ramp of Masada also helped. Here’s a shot of me and Oleg coming up to the last water station around the 18th kilometer. We look a bit wilted but are trying to put on a good show. We crossed the finish line together. Yes, that’s our time above the track (final time 2:36). Not brilliant but, hey, we finished! Oleg was high-fiving me and waving at me before the finish line, later at the finish party, inside the bus back to Arad, and even back at the Arad parking lot. I think I helped him as much as he helped me, because it was getting hard to keep my spirits up when I was so tired. The camaraderie of runners is one of the great things about running. Sometimes total strangers will team together and the sum is greater than the total of its parts. 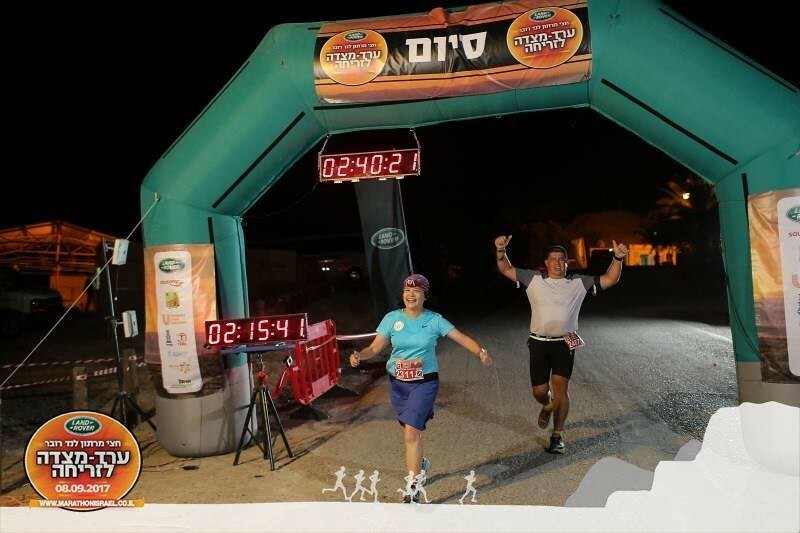 Exactly one week later, I ran as part of a 6-person (mixed) team in Tanach Tashach. We covered 200+ kilometers in 26 hours and I ran a total of 34.5 kilometers. Although I rested between the two events, I was not nearly up to speed and had to walk most of the hills. Here I am coming in to Mesilat Zion. The first day was brutal. It was bloody hot (all around me, people were walking the hills; I wasn’t the only wimp) during the first leg, 8 kilometers. I was paired with someone who was a much stronger (and younger) runner, so she ran ahead of me on the legs where we ran together. The second leg, a few hours later, was 13 kilometers in mid-afternoon. It got pushed later and later and we got caught running after dark without headlamps. I was alone, running along loose stones downhill, and eventually I turned on my phone flashlight app to light the path when it became too dangerous to continue in the dark. I can tell you that it’s not easy to run off-road with your phone for light. Your hand and arm start getting cramped from holding the light onto the path. During that first day, I ran the equivalent of a half marathon and was exhausted. I got a few hours of sleep (thank heavens we rented a zimmer with real beds and a shower!). I ran with Noa at 2 a.m. for the third leg. 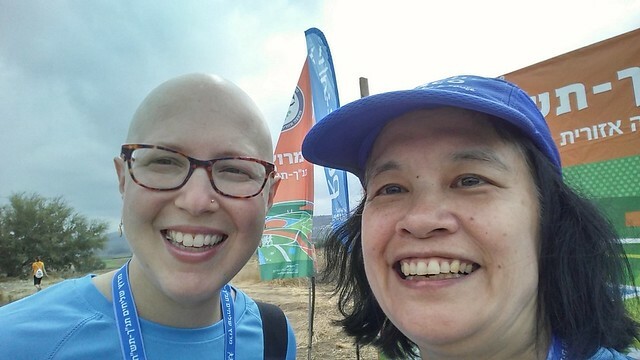 Fortunately, that was only 6.5 kilometers and Noa (of #forceofnoa fame) wasn’t a whole lot faster than me because she’d done chemo the previous Sunday. The next day there was a brief rain that, instead of cooling us down, turned the forest into a tropical jungle. At least it wasn’t enough rain to cause serious mud, but the humidity was uncomfortable. 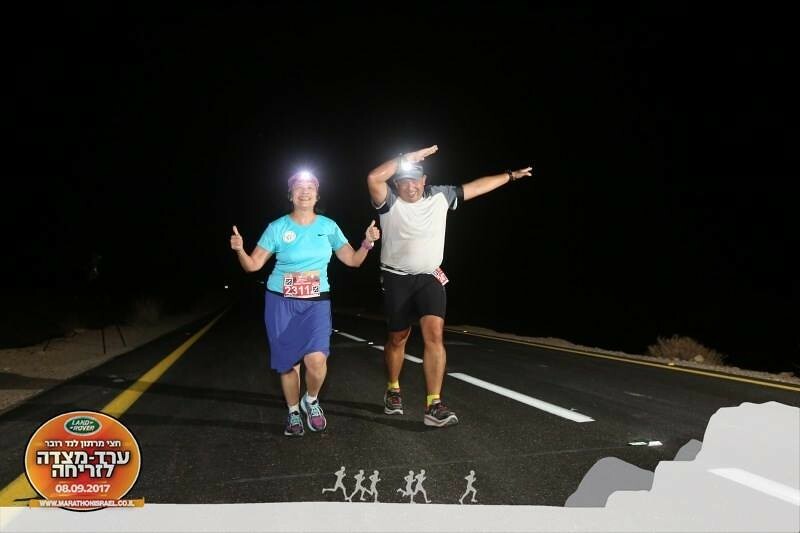 We were worried that we would be disqualified because our times had slipped so much that we were in danger of the stations closing before our runners arrived. The station volunteers were very helpful. 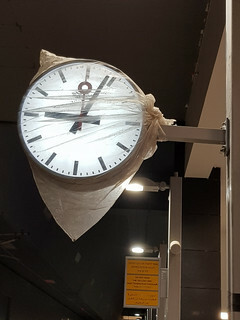 When it started raining again, they packed everything else first, leaving the sensor set up as late as possible. 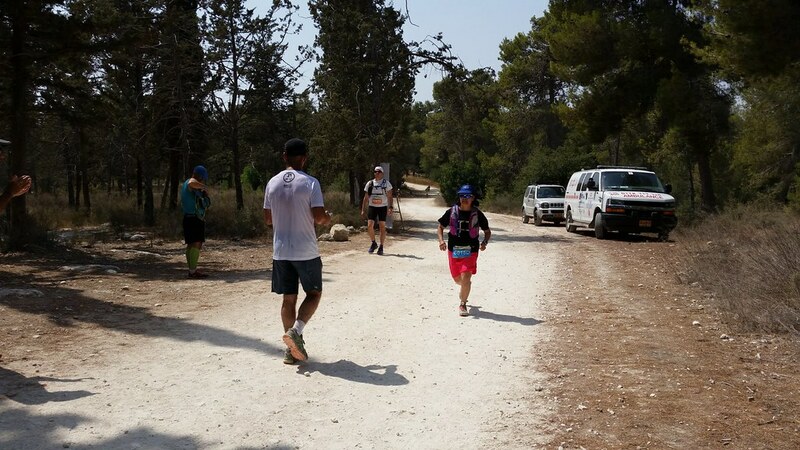 Our #3 runners managed to get to Kfar Uriah in time and the rest of the stations had generous closing times, so we finished without being disqualified. Actually, we weren’t the last in the 6-person teams, of which there were very few. 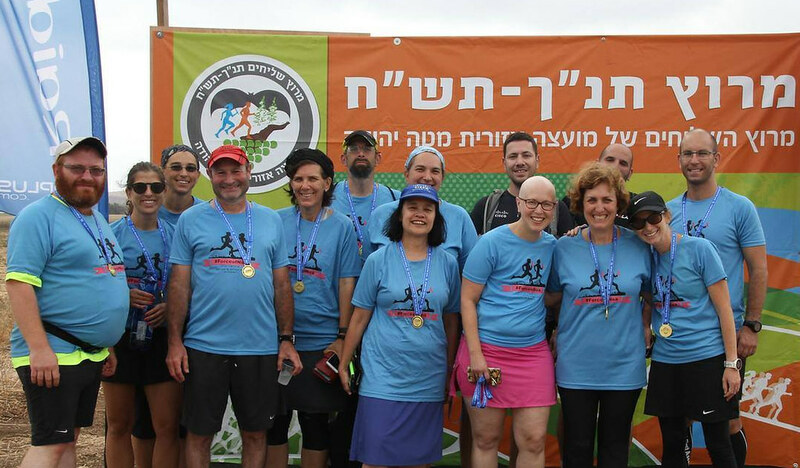 I hadn’t realised that the vast majority of Tanach Tashach teams have 8 runners each. So yay for us! Me and Noa. I’m having a bad hair day from the awful humidity, but that’s small potatoes, as they say. 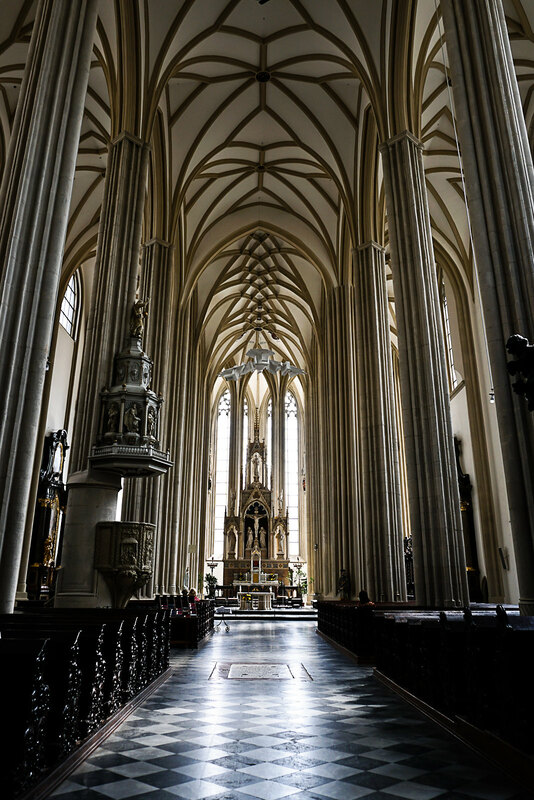 Central nave of St. James’s Church, a late Gothic (13th century) structure. 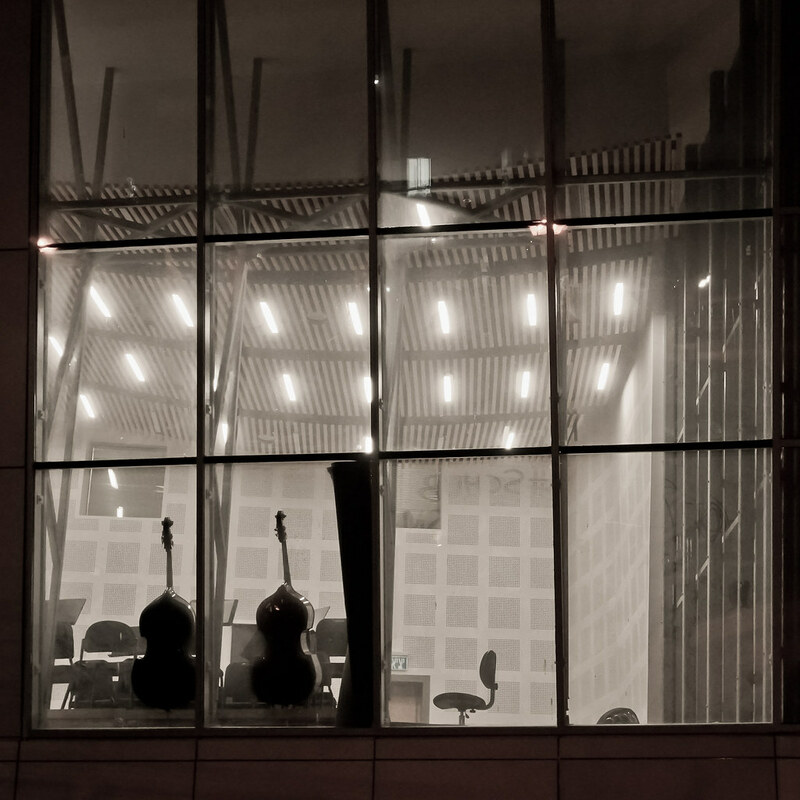 One advantage of a mirrorless camera is that it’s small and can be operated soundlessly. Because there were no other tourists around, I wouldn’t have felt comfortable photographing this interior with a big DSLR. 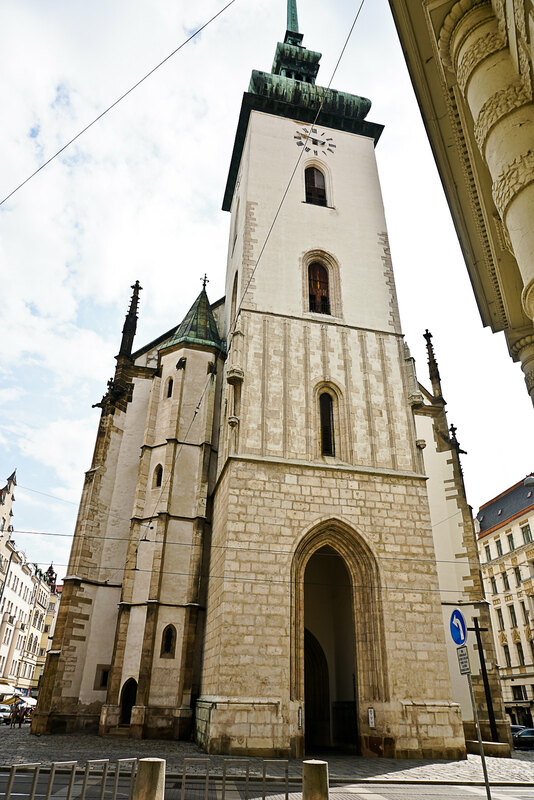 Exterior of St. James’s Church. 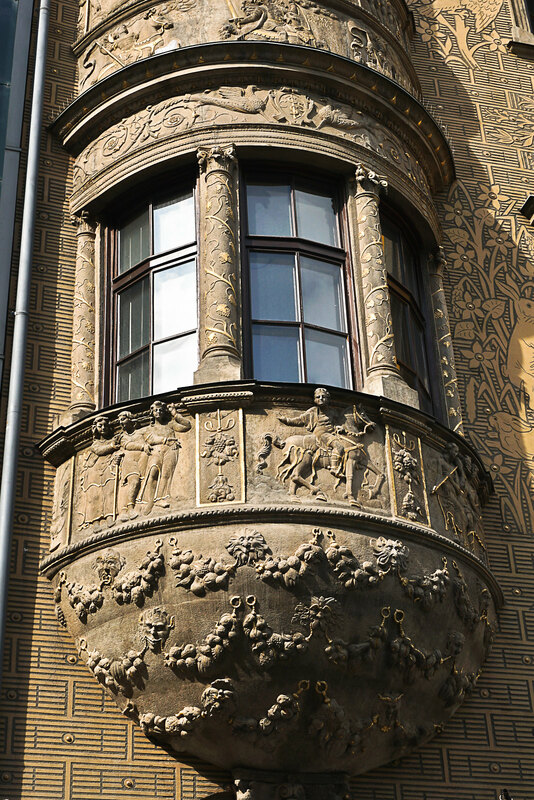 Detail of House of the Lords of Lipá, an extremely ornate 16th-century Renaissance building (the sgraffito facade is actually 19th century), now a shopping center. 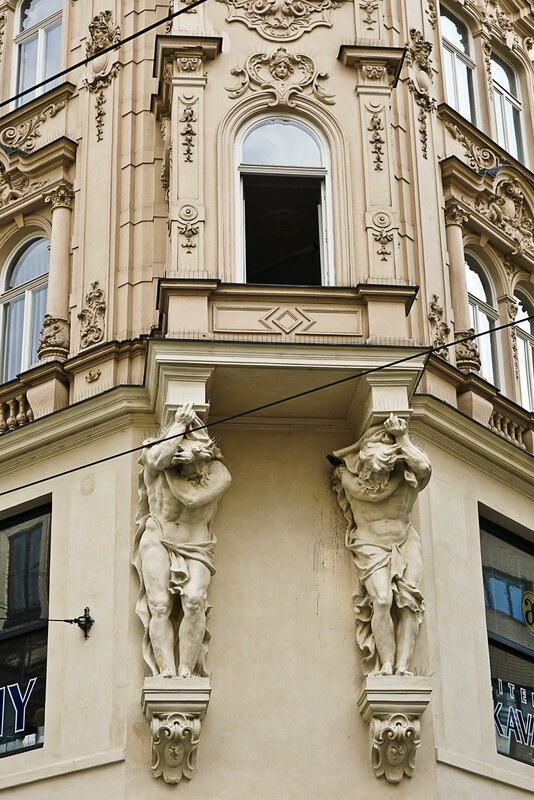 Cool building decorations in central Brno.